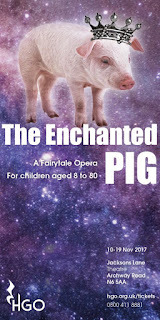 Jonathan Dove and Alasdair Middleton's The Enchanted Pig premiered at the Young Vic in 2006. Written for a cast of opera singers and singing actors, the piece is billed as a musical tale though it is through composed throughout. The work is being revived by Hampstead Garden Opera at Jackson's Lane Theatre. Laura Attridge's production, conducted by Hannah Quinn, opens on 10 November 2017 and runs until 19 November. 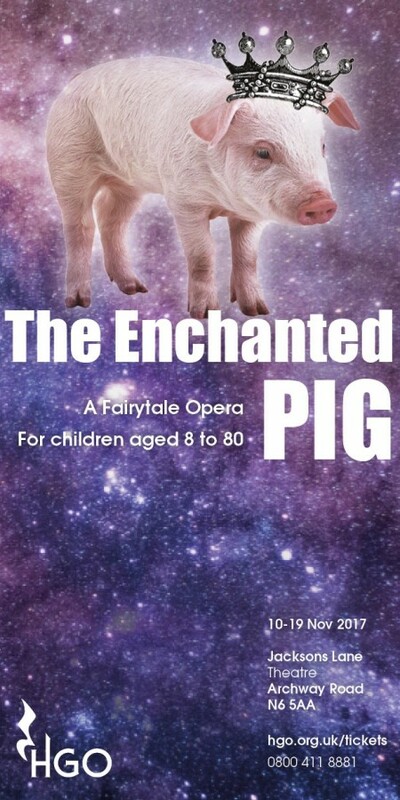 Based on Romanian and Norwegian folk tales, the piece tells the story of a princess who marries a pig (in fact an enchanted prince), but that is only the start of her problems. In Flora, the princess in question, the piece gives us a feisty heroine who goes off in search of her love, and meets a whole welter of people. The cast of eight play a total of 15 named characters in all. I remember being enchanted by the work when we saw it in 2006, so this new production should be a delightful chance to re-encounter the work.